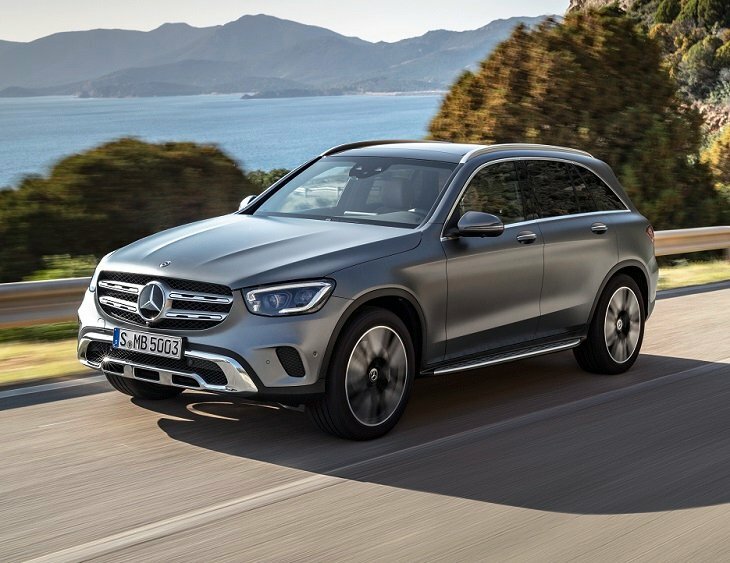 Positioned where prestige, price, and performance converge in a reasonably roomy luxury SUV, the 2020 Mercedes-Benz GLC-Class will no doubt continue to serve as one of the company’s best-selling vehicles when it goes on sale in late 2019. The automaker detailed changes for the GLC 300 in advance of the SUV’s debut at the 2019 Geneva Motor Show. Highlights include a more rugged appearance, new drivetrain systems, improved driver assistance and collision avoidance technologies, and a new Mercedes-Benz User Experience (MBUX) infotainment system. Front and rear design changes intend to convey a wider, sportier, off-road-ready presence. That explains the somewhat garish standard front and rear skid plates on the bumpers. Additionally, the GLC 300 features a bolder grille design, redesigned standard LED headlights and taillights, more chrome, and new wheel designs. New paint colors include Graphite Gray and Selenite Gray Magno. Choose the AMG Line option package for a chrome diamond-block grille, more aggressive design details, and standard 19-inch AMG aluminum wheels. A set of 20-inch wheels is also available. Aside from the new MBUX infotainment system and its redesigned console touchpad with haptic and acoustic feedback, the GLC’s interior is largely unchanged. A couple of revised steering wheels debut with new touch-control buttons for the instrument cluster and MBUX system, and drivers press a redesigned turbine-style engine start/stop button. New wood trim options include Natural Grain Gray Oak and Natural Grain Walnut. One of the more significant changes to the 2020 Mercedes-Benz GLC 300 is the new turbocharged 2.0-liter 4-cylinder engine with more power and claimed better fuel economy. The engine makes 255 horsepower – 14 more than before – and the same 273 lb.-ft. of torque. The engine powers the rear wheels through a 9-speed automatic transmission. As an option, a redeveloped 4Matic all-wheel-drive system is available. Mercedes also reports that it has recalibrated the GLC’s stability control system. For 2020, the GLC receives new and improved driver assistance and collision avoidance systems. New to the 2020 Mercedes GLC, the MBUX infotainment system debuts with a 10.25-inch display screen and multiple ways to interact with and issue commands to the technology. Additionally, MBUX offers new connectivity features and an available Augmented Video for Navigation option that uses a video feed from a forward looking camera to augment and ease navigation. Digital instrumentation is also optional, shown on a 12.3-inch display in Classic, Sport, and Progressive themes. Mercedes also installs Car-to-X vehicle-to-vehicle communication technology in the new 2020 GLC-Class, a precursor to a future in which vehicles “talk” to one another and their surrounding infrastructure.